When did Kano stop practicing judo? I read somewhere that he stopped in his mid thirties, yet I have seen old movies of him doing Ju No Kata and he appears much older than mid thirties. Udon wrote: When did Kano stop practicing judo? I read somewhere that he stopped in his mid thirties, yet I have seen old movies of him doing Ju No Kata and he appears much older than mid thirties. The last reference I recall of him participating in randori is when he was in his early 30's in some Kodokan event. After that he's always listed as performing kata. When he was 60 he stopped wearing keikogi, apparently except for a formal photo. Here is writings about Kano Jigoro from old names encyklopedia. I found a newspaper article regarding Kano recovering from breaking several bones in practice in his early 30's. It was never made clear which bones. That could have taken the wind out of his sails. Takezoe Shin'ichiro was Kano's father in law. An interesting character, a noted Sinologist. There's an indication that Kano and his wife lived with him for a while. noboru wrote: Here is writings about Kano Jigoro from old names encyklopedia. 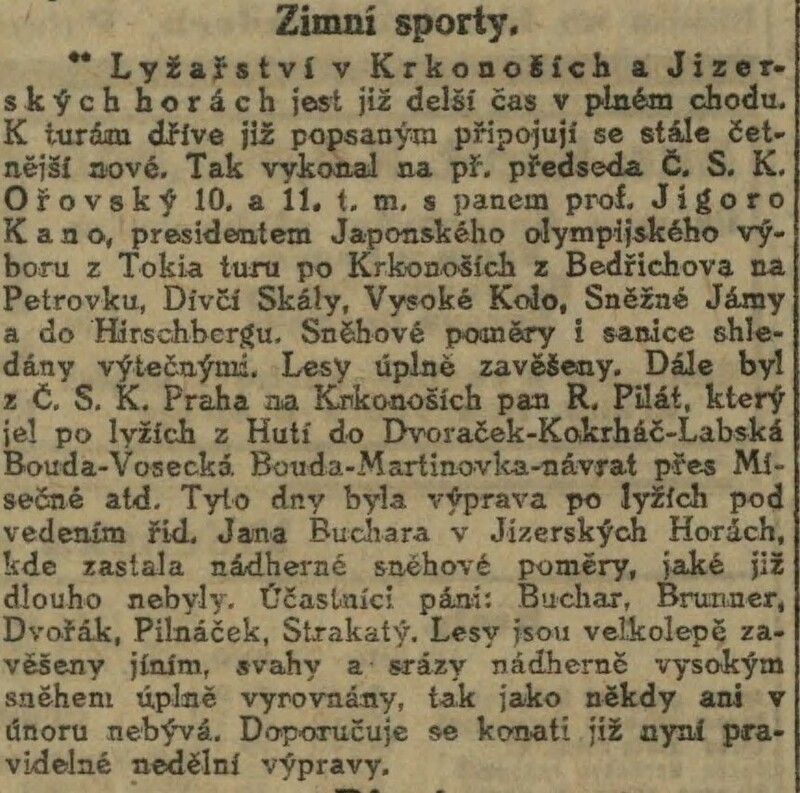 I found articles from 1912-11-09 (newspaper Narodní listy). 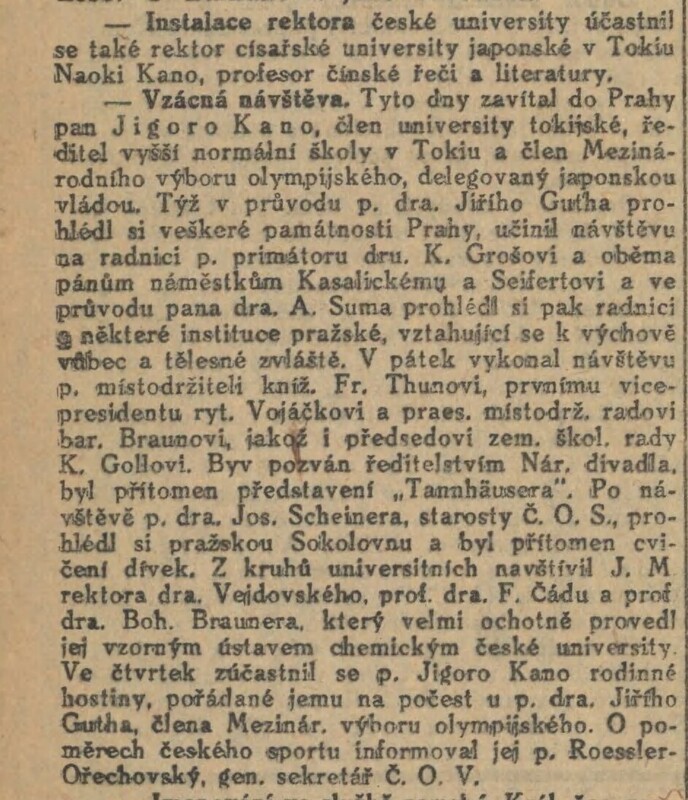 There is info about visit of Kano Jigoro in Prague, Austrian-Hungarian monarchy this time other Czechia today. He traveled around european countries, in summer he was in July in Stockholm - IOC Meeting). There is info about invitation from czech IOC members, he interested about czech body system education and group SOKOL ( czech organization for body and mind improvement). He saw Prague too, met with leadears of city and czechosloval IOC members. Next 2 days he spent in czech mountains Krkonose with some czech IOC members and did 2 days trip on the mountain. In the first picture is article (above) about visits of Mr. Naoki Kano (rector of japanese emperor university in Tokio, professor chinese language and literature) in Prague in event naming new rector of czech Charles university. Could be Mr. Naoki Kano any related with Takezoe Kano? I found info about Jigoro Kano english teacher - Ms. Nona Ransom. She went to Japan in 1927.... Jigoro Kano improved his english in his older age still... true man. 13/14. Nona went to Japan in 1927 because she had wanted to see the country for some years. Her contacts with the Yoshidas had, as it were, prepared the ground for her through reports of her relationship with the Manchus and others. During the three year, Nona stayed in Japan she taught English at the following three establishments in Tokyo: The Buddhist University, Komazawa, The Men’s' Normal Training College, with demonstration lessons at the attached Boys' Middle School, and The Peeresses School. 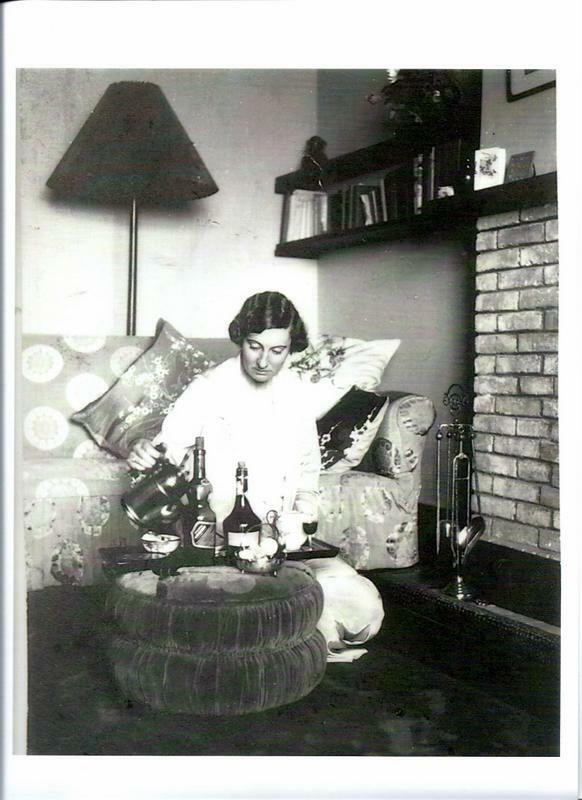 Also there is a note in one of her papers to the effect that she had been a "Teacher of the English Language and Foreign Etiquette, under the Imperial Household", in Japan. During the summer holiday periods in 1928 and 1929, she visited Korea and what was then known as Formosa. In Korea she stayed at several Monasteries, accompanied by a Japanese student from the Buddhist University, who acted as her interpreter. I think she did something similar in Formosa. I would presume that her time in Japan introduced her to aspects of Buddhist philosophy and experience and it was at that time that she had got to know Suzuki and indeed others, such as Jiro Kano, who was, I understand, the founder of modern Judo. of his each visit was contributed to Kano’s high foreign language ability. and German and was able to communicate with Chinese through writing. mainly developed during this period. University of Tokyo. Those enabled him to write Chinese. ４）Like Kano said himself, his English ability had been improved through visiting foreign countries and welcoming foreign guests in Japan. ５）He made various proposals for improving English education in Japan. chronologically, very interesting results have appeared. results added another research questions for future studies. Nice picture - teacher (may be Kano Jigoro) gives kogi (lectures) or mondo (questions and answers). Professor Kano expounded on the method of Judo instruction and put forth four items: (1) kata (form), (2) randori (free practice) (3) kogi (lectures), and (4) mondo (questions and answers). Lectures include those of a long duration for the purpose of understanding Judo more deeply and those of dealing with technique, practice lessons, and matches in general. The content of the lectures covers the history of Judo development, fundamentals, the value of training, the sport as a science, theory of physical education, and other topics. This is done logically and systematically over a long period. The latter are directly related to technique, directly related to dojo etiquette and practice attitude as well as social life, and directly related to social life as well as a social attitude. When such lectures are given it is hoped that they will make an impression on the mind whether it might be 50 minutes or even a short 5 minute lecture on technique. When trying to make logical and systematic theory understood, it should be done within a short time. Since for most a considerable amount of time is necessary, some other time and opportunity must be considered. When planning lecture material, be careful that it is (1) adjusted according to the level of the development of the trainees and their way of life, and (2) sensitive to the trainees’ feelings and their understanding. There must be a prudent choice of the lectures given by the instructors. There is a saying in Japan that “ryoyaku, kuchi ni nigashi” (good medicine tastes bad). In the Hagakure: “In the world there are many who teach and few who enjoy that teaching. And those who follow those teachings are rare”. To achieve a result through education in the Way is difficult. This is actually a turning point in the life of the young people who learn judo, and since it nurtures the roots of the spirit and the body the instructors should keep the spirit of Professor Kano in mind. We find the following passage by Professor Kano about the quest, realization, and instruction of the Way of Judo: “There is nothing greater under the heavens than education. The virtue of one spreads to many; in real education goes on for hundreds of years”. On this link are Jigoro Kano posters in nice quality for print. Here is another opponent of Japanese militarism, he is the father of Judo, involved in International Olympic until the last day of his life. He fight for Tokyo Olympic despite the odds was against him(included the Japanese military). Because of his patriotic spirit, and opposition to militarism, he whole hearty believed by having Olympic games in Japan, it will promoted the spirit of global peace in Japan and avoiding war by Japanese militarism. He successfully gained the right for Japan to hold 1940 Summer Olympic Games in Tokyo, but the game was later cancelled by Japanese government after his death. He is a Japanese hero....one of only few who dare to stand up against militarism. Kanō Jigorō(嘉納 治五郎, 28 October 1860 – 4 May 1938), creator of Judo and founder of the modern Japanese educational system, member of Japan's Olympic Committee, and de-facto foreign minister for Japan was a staunch opponent of militarism. Concerned that his Judo school, the Kodokan, would be used as a military training center, he obtained a promise from the Emperor that it would not be. Alternate sources list different causes of death, and some consider his passing to be suspicious. Judo was the first Japanese martial art to gain widespread international recognition, and the first to become an official Olympic sport. Pedagogical innovations attributed to Kanō include the use of black and white belts, and the introduction of dan ranking to show the relative ranking between members of a martial art style. Well-known mottoes attributed to Kanō include "Maximum Efficiency with Minimum Effort"「精力善用] and "Mutual Welfare and Benefit."「自他共栄」. 1860- Kano was born into a relatively affluent family. His father, Jirosaku(嘉納治朗作（希芝）,b 1813-d1885), was the second son of the head priest of the Shinto Hiyoshi shrine in Shiga Prefecture. He married Sadako Kano(b? – d1869), daughter of the owner of Kiku-Masamune sake brewing company and was adopted by the family, changing his name to Kano, and ultimately became an official in the Bakufu government. Kano Jigoro, the youngest of five children, was born in what is now Hyogo Prefecture on October 28, 1860. Jigoro Kano was born in the seaside town of Mikage in 1860. His father and uncle were both adopted by Kano family as mukoyoshi . Note: A mukoyōshi (婿養子) (literally "adopted son-in-law") is a man who is adopted into a family without a male heir, and who takes the family's surname. (Traditionally in Japan, a woman takes her husband's name and is adopted into his family; see married and maiden names: Japan.) This is done to preserve the name and occupation of the family when there is no suitable male heir. Usually, when there is an unwed daughter of a suitable age, she will marry the mukoyōshi, but if there is no daughter, the mukoyōshi can take a bride from outside his adopted family. Mukoyōshi have a low status in society, yet in one study, up to a quarter of heirs in a community were mukoyōshi. Milage was located near Kobe, famous for sake industry. Kano was the proprietor of the famous Kiku Masamune brand, now under Kiku-Masamune Sake Brewing Co.,Ltd. 1867- Jigoro Kano had an academic upbringing and, from the age of seven, he studied English, Japanese calligraphy (書道 shodō) and the Four Confucian Texts (四書 Shisho) under a number of tutors. 1870- Kanō became a student in 1870 in the Seitatsu Shojuku(成達書塾) in Ryōkoku, which is pretty much a school for learning how to write. His teacher was Ubukata Keidō. He also got acquainted there with the Chinese Classics. Ubukata-sensei himself was strongly influenced by Western thought and tried to convey this on to Kanō. Given Kanō’s young and inexperienced age, a first step to do was to recommend that he’d study English. He was sent to Mitsukuri Shūhei to do so. 1873- Studied at boarding school, Ikuei Gijuku, located at Karasumori-cho, Shiba, Tokyo. When he was fourteen, Kano began boarding at an English-medium school, Ikuei-Gijuku in Shiba, Tokyo. The culture of bullying endemic at this school was the catalyst that caused Kano to seek out a Jujutsu (柔術 Jūjutsu) dojo (道場 dōjō, training place) at which to train. 1874- Transfer to English Department, Tokyo School of Foreign Language. Classmate included Takaaki Kato, who later become Prime Minister. Tōkyō School of Foreign Languages or Tōkyō Gaikokugo Gakkō(東京外国語学校). 1979- Approached to teach in Gakushuin while still studying . Moved to Eishoji, and started preparatory school, Kano Juku( 嘉納塾) in Feb 1979 . Kano Juku( 嘉納塾)was a tutoring school(the forerunner of the Kodokan) where Kano taught English. Similar to the Kodokan at that time, he had few pupils. 1881- He graduated in July of 1881 (Meiji 14, 7th month)from Tokyo University with a Bachelor’s Degree of Letters or Bungakushi(文学士,東京大学文学部哲学政治学理財学科卒業). Noted, many sources stated Tokyo Imperial University, which is wrong, as it was still Tokyo University. 1882 – He returned to the same Faculty of Letters to focus on Aesthetics and Moral Philosophy, in what thus was graduate study (or as they call it in England ‘Postgraduate). He finished this study in July of 1882. It is there where he also studied under Ernest F. Fennolosa. 1882- The year 1882 was a landmark year for Jigoro Kano. He was appointed lecturer(学習院教授補,Relief lecturer) in politics and economics at Gakushuuin(学習院). After appointment as lecturer in Gakushuuin, he moved to Eisho Ji (永勝寺). 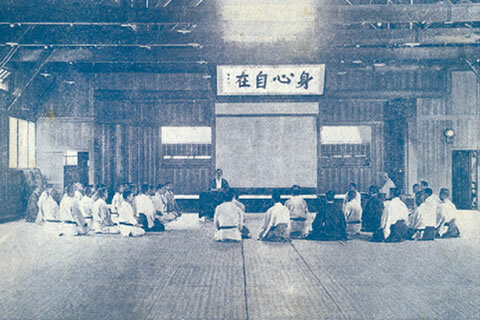 In 1882 Kano Jigoro organized the Kodokan judo school at Eishoji, a Buddhist temple in Shitayakita, Kita Inari-cho, Tokyo(now Higashi Ueno, Daito –ku), Tokyo. Judo (Japanese: 'the way of softness'). It started as a twelve Tatami room. He became an instructor of the Gakushuin in 1882 and eleven years. In 1882 he started the Kobunkan English Language School. This school was to teach Japanese children the English language. The school was closed in 1889 when Dr. Kano took his first trip abroad. Gakushuuin(学習院), a private school for the nobility or Imperial family members and peerage(Kazoku,華族), administrated by Gakushuin (華族會館). The college was initially found in 1847 in Kyoto Imperial Palace or Kyōto Gosho (京都御所), it then moved to Kanda Nishiki-cho ,Tokyo in 1877. The meaning of Gakushuuin(学習院) is Chinese characters for "to be taught" and "to learn" in the following quotation from the Analects of Confucius: "To be taught and to learn the truth is such a precious thing." 1882 - Gakushuin become independent from Peer Club(學習院脫離華族會館獨立)，and under Ministry of education(文部卿).Note: 文部卿 was now Minister of Education( 文部大臣)from 1885. 1884 Gakushuin became a government school under the jurisdiction of the The Imperial Household Agency (宮內廳, Kunaichō), with entry now open to children from outside the ranks of the nobility as well. It was the only government college administrated by The Imperial Houehold Agency(宮內廳, Kunaichō), and not under Education ministry(文部卿).The college was under leadership of Lt General Tateki Tani , later Viscount Tani Tateki (谷干城), who later become Minister of Agriculture and Commerce in 1885. The Imperial Household Agency (宮內廳, Kunaichō) is a government agency of Japan in charge of the state matters concerning Japan's imperial family and also keeping the Privy Seal and the State Seal. In 1911, it was named the Imperial Household Ministry (宮内省 Kunaishō). 1883- Kano received his teaching license in Kito-Ryu. The dojo was moved to larger area in Kanda, Tokyo. 1885- It was reported he received his Doctorate from Gakushuin in 1885 and he was promoted to Professorship(教授), some even said he become Principal of Gakushuin. But the principal of Gakushuuin was 谷干城 from 1884-1885. May be he was promoted to Soninkan,a senior official. Gakushuin was not a university, it was not possible to award a doctorate degree.(戰前學習院只有幼稚園至高等科，雖然曾經於1893年嘗試開辦大學科，但於1905年廢止). 1886- Headmaster of Goko( 第五級高等學校校長,(旧制第五高等中学校),now Kumamoto University(（現・熊本大学）. 1888- Eventually a military man by the name of Lt. General Miura Sogo(三浦梧楼)was brought in to head the Gakushuin. 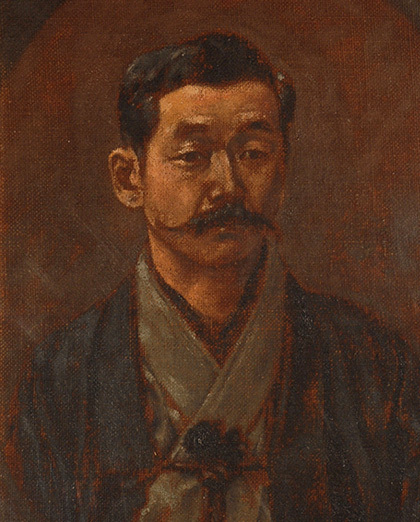 1889- Promoted as Vice-Principal of Gakushuin( 学習院教頭,きょうとう). Viscount Miura Gorō (三浦梧楼)was the principal from 1888 to 1892. A clash of opinions between Kano and Miura Gorō resulted in Kano being sent abroad for sixteen months by the Imperial Household Agency to Europe to study European education. Miura being a military man favored a more cadet style education at the Gakushuin and wanted to confine the school to educating the sons of the former military families. Kano on the other hand was keen to educate the brightest people without regard to their samurai background or lack of it. 1889 - 1891 - Kano spent sixteen months touring Europe. First trip was to Paris, France. 1891-1893 - on his return to Japan, he was sent to Kumamoto on the island of Kyushu where he was appointed headmaster of the Kumamoto High school (1891-3). In 1891 he left the school and became the principal of the No. 5 Junior High School(第五高等学校長)in Kumamoto, Kyushu. While as principal at the school he introduced Judo as an additional gym class. 1893- He was appointed as Chief of the Inspectorate for School Textbooks, Tokyo. Six months later, he was appointed as Principal in the No. 1 Junior High School in Tokyo. 4 months later he become Principal of Tokyo Teacher Training college or Tokyo Koto Shihan Gakko(東京高等師範学校)until 1897. A Qing's Chinese education reformer, Zhang Baixi(张百熙)and Viceroy of Huguang, Zhang Zhidong (張之洞), asked Kano to instruct Chinese students in Japanese education methods in 1893. 1899-Director/Head of Bureau of General Education or Monbusho(文部省普通学務局長). 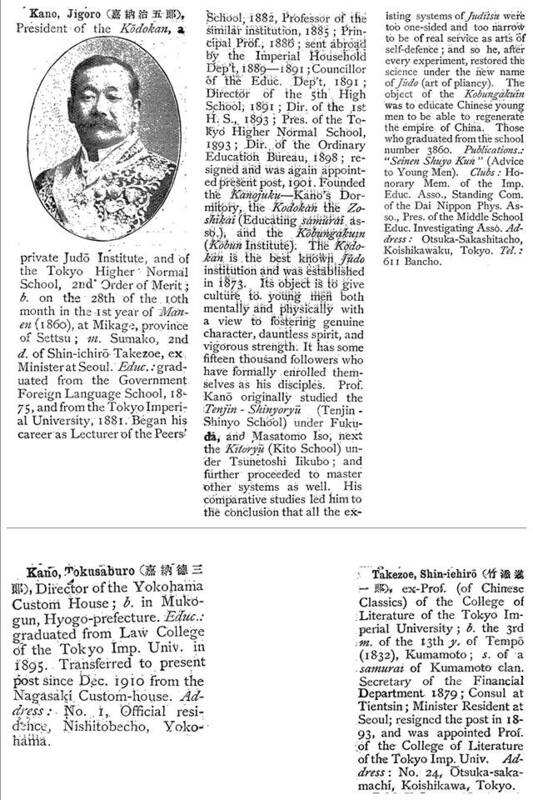 1901-1920- Reappointed 3rd time as Principal of Tokyo Teacher Training college (Tokyo Koto Shihan Gakko, 東京高等師範学校) , now University of Tsukuba（東京教育大学を経た現在の筑波大学）September of 1893, he was appointed to the position of Principal at the Tokyo Teacher's Training College, which would later become a part of Tokyo University. This was quite a prestigious position for someone only thirty-three years old. It was also a position Kano would hold for another twenty-seven years, until 1920. 2. Huang Xing(黄興,1874-1916),Chinese revolutionary leader, militarist, and statesman, was the first army commander-in-chief of the Republic of China. As one of the founders of the Kuomintang (KMT) and the Republic of China, his position was next to Sun Yat-sen.
4. Qiu Jin(秋瑾,1875-1907）,Chinese anti-Qing Empire revolutionary, feminist and writer. She was executed after a failed uprising and today is considered a hero in China. 5. Chen Duxiu(陳独秀,1879-1942）, he was a leading figure in the anti-imperial Xinhai Revolution and the May Fourth Movement for Science and Democracy. Along with Li Dazhao, Chen was a co-founder of the Chinese Communist Party in 1921. He was its first General Secretary. Chen was an educator, philosopher, and politician. In 1902 Dr. Kano traveled to Peking, China. He went to share his ideas about solving the problem of education in China and visit Mr. Choshido . Unfortunately, the school was shut down in July of 1909; the year Dr. Kano became a member of the International Olympic Committee. Fall- Appointed as a member of the International Olympic Committee. Became the first Japanese member of the International Olympic Committee. Kano is often called the father of Japanese Physical-education. He was in education sector of 26 years. 1922 January- Established the Kodokan Culture Association . Elected to the House of Peers. 1922- He was elected to the Upper House of Aristocrats (Ki-zoku-In 貴族議員) in 1922 when Kano had turned sixty two. The House of Peers of Japan (貴族院, Kizokuin ) was the upper house of the Imperial Diet, as mandated under the Constitution of the Empire of Japan (in effect from 11 February 1889 to 3 May 1947). The House of Councillors(参議院 Sangiin) is the successor to the pre-war House of Peers. During March 1922, Kanō brought all this to fruition through the introduction of the Kodokan Bunkakai, or Kodokan Cultural Association. This organization held its first meeting at Tokyo's Seiyoken Hotel on 5 April 1922, and held its first public lecture three days later at the YMCA hall in Kanda. 1927- Founding of Nada Middle School(灘中学). Now the school is known as Nada High School(灘高等学校),and Nada Junior High School(灘中学校)which is the affiliate school of Nada High School. The school was found by the sake producers of Nada Ku region(灘区). 嘉納治郎右衛門（菊正宗, now Kiku-Masamune Sake Brewing Co.,Ltd. (菊正宗酒造株式会社), 嘉納治兵衛（白鶴宗, now Hakutsuru Sake Brewing Company Limited (白鶴酒造株式会社), and 山邑太左衛門(櫻正宗, now Sakuramasamune Company, Limited (櫻正宗株式会社). 1936 July- Attended the IOC Session in Berlin where Tokyo succeeded in its bid to host the 12th Olympic Games (1940). In the vote conducted at the Berlin IOC Session in July 1936, Tokyo beat off the challenge of Helsinki by 36 votes to 27. Kano said the following at this session: "My 27 years of Olympic activity since becoming an IOC member have finally borne fruit. Now, the Tokyo Olympics must be an example to the world and the Olympics must use this opportunity to become a part of global culture." the first games held outside Europe and the USA. Japan was the first country in the Far East to be given a Games. 1938- In March, the IOC held its 38th Session in Cairo. Despite all rumors to the contrary, Japan declared that it did indeed intend to stage the Games irrespective of the persistence of war with China. Klingeberg (Techinical Advisor to Tokyo Olympic appointed 1-4-1937), present in Cairo to report on Tokyo's progress, lent verbal support to Japan's resolve. Many IOC members, however, harbored severe reservations about the Games remaining in Japan. In the face of an offer from Finland to stage both Summer and Winter Games if Japan could not, the members voted to give the IOC Executive Committee full authority to transfer the Games accordingly if the need arose. Kano sought to have the 1940 Olympics held in Tokyo. "Sportsmanship is above war," he told one press conference. He succeeded, amazingly, at a time when Japan was seen as suspect and ruthless in its colonization of its neighbors. That Kano was successful can only be attributed to the great respect he had from the world, and also, undoubtedly, respect at his courage for seeking the games, to bring the spotlight of the world on Japan. America and England, both resolutely opposed to Japanese policies in the Far East, ultimately supported Kano's controversial bid. Kano Jigoro(嘉納治五郎) died on 4-5-1938. Kanō died at sea, while on board the NYK Line motor vessel MV Hikawa Maru, while returning from Cairo. Jigoro did not return to Japan immediately after Tokyo won its hosting bid in Cairo. Instead, he attended the memorial service being held for Baron de Coubertin in Athens. He then traveled to the United States via Italy and France. In the United States, he met with the other IOC (International Olympic Committee) members and thanked them for their cooperation in Japan's bid to host the Olympics, and requested their help in ensuring that as many athletes as possible participate. This was very much in keeping with Jigoro's Judo creed of "beginning and ending with respect (a bow)". Having completed this duty, Jigoro boarded a ship for Japan, and died en route, never to set foot in his homeland again. His advanced age, combined with fatigue from the journey, had brought on pneumonia. Within a few weeks of Kano's death, the government of Japan cancelled the games. The Japanese government, faced with the possibility of two more years of conflict in China and shortage of funds and materials, has abandoned its support of plans to hold the 1940 games in Tokyo. Within a few months, invaded China from Manchuria. The prime minister Prince Konoe Fumimaro(近衞文麿,b1891-d 1945) and his cohorts were all avid proponents of Budo (武道). Not to be confused with militarism, budo is a process of training throughout one's life to attain mastery of self. "Here is another opponent of Japanese militarism, he is the father of Judo, involved in International Olympic until the last day of his life. He fight for Tokyo Olympic despite the odds was against him(included the Japanese military). Because of his patriotic spirit, and opposition to militarism, he whole hearty believed by having Olympic games in Japan, it will promoted the spirit of global peace in Japan and avoiding war by Japanese militarism. He successfully gained the right for Japan to hold 1940 Summer Olympic Games in Tokyo, but the game was later cancelled by Japanese government after his death. ...."
More than a little of this article is simply made up. by _some of _ the sake producers of Nada Ku region(灘区). Yamamura Tasaemon? 山邑太左衛門(櫻正宗, now Sakuramasamune Company, Limited (櫻正宗株式会社). The Kanô men mentioned were distant Kano relatives - the extended clan split hundreds of years ago into the two different sake breweries, Kikumasamune ('Chrysanthemum Sake') and Hakutsuru ('White Crane'), two of the oldest brand names in Japan. The Nada sake-making region of Kobe still has many Kano family members. I was doing some research there and asked a man about the Kanô history - standing near the school, he waved at Mount Rokko looming above us and said someone named Kanô owns about half of whatever you see between here and the mountaintop - they're all over the place. The school mentioned, Nada High School, is the site of a recently unveiled statue of Kano shihan (Uemura kancho went to the unveiling) but the money for the school came from the sake brewers. The high school is very famous in Japan, and has a great academic history of graduates getting into the best colleges. 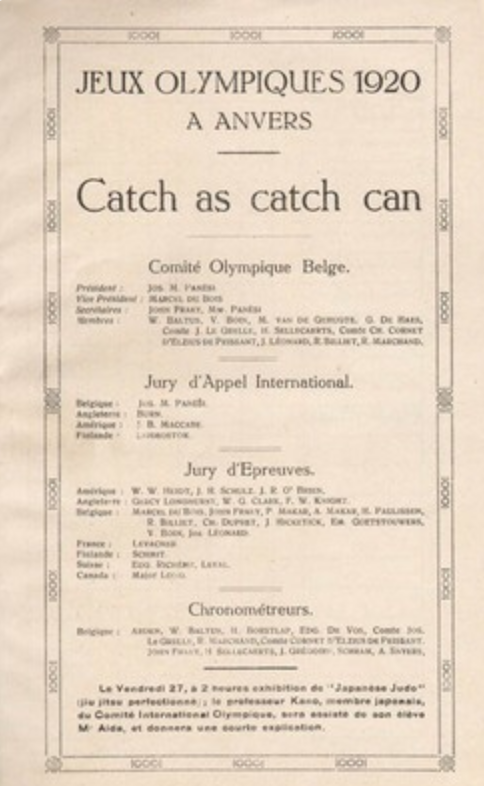 at the 1920 Antwerp, Belgium Olympic Summer Games. The programme has a matrix of all the wrestlers listed by their country within each weight class. on 27 August by Professor Jigoro Kano and Mr. Aida. Mr. Aida was noted Kodokan Judo master Aida Hikochi. Professor Kano established the Japanese Athletics Association and became their first President in 1911. In 1912 he became the first oriental member of the International Olympic Committee. as an Olympic Sport until his death in 1938. This exhibition was probably the first appearance of Judo at an Olympic Games. What a great find, thank you. That is almost certainly of the information yet to be pulled together by informed observers around the world. Also, the people that he demonstrated to would likely have included General Douglas MacArthur, head of the US Olympic Committee. Kano shihan as principal of school in Kumamoto - Principal of the Fifth High School, a post he held from 1891-93. In the group photo Kano shihan is dead center - the older bearded man to his left rear is the school's Chinese classics teacher, another teacher that Kano hired (along with Lafcadio Hearn). I don't know if the conversation is really or it is fiction, but is is very nice. It was another stifling evening in Naha as we packed into the town hall. The doors and windows had been opened wide, but there wasn’t a breath of wind to circulate the air. In the eager press of bodies, the sharp smell of fresh sweat stung my nostrils, but I was too excited to care. I was with the other boys from my karate class and we were in high spirits. The reason for this excitement was a visit from the founder of judo, Dr. Jigoro Kano. Judo was a new and popular way to develop fitness and fighting ability, and with its exciting competitions, it was already being considered as an Olympic sport. Tonight, Dr. Kano himself would be demonstrating his art. As one of the foremost citizens of Okinawa, Miyagi had a seat on the front row next to the mayor. Beside them, a clutch of journalists and photographers were well-placed to capture the evening’s events. I’d managed to get a seat only a few rows back from Miyagi, along with the other boys from the karate club. We chatted eagerly as a group of young judo-men in crisp white suits laid mats down in the center of the hall. The head of the Naha Judo Club strode into the center and the crowd fell silent. He gave a short speech welcoming Dr. Kano, and when Kano stepped out to join him there was rapturous applause. To my surprise Kano was an old man—far older than I’d imagined—with a thick grey moustache and a down-turned mouth, though his stride was sprightly and he bristled with energy. He was joined on the mat by his senior assistant, whom he introduced as Mr. Nagaoka. I expected Kano to call his students out to demonstrate, but instead he proceeded to perform a flowing two-man drill using only Mr. Nagaoka as his partner. Despite his scholarly appearance, Kano spoke little during his demonstration, offering no more than the name of the technique he was using, or a simple introduction to a new theme such as locks or chokes. He demonstrated his throwing techniques in groups based on the direction of the opponent’s force: throws for an attacker moving toward you, throws for an attacker pulling backward, throws for an opponent moving sideways. Kano and Nagaoka performed a seamless demonstration of the wonderful throws and submissions of judo. It went on for almost an hour and the power and beauty of their actions spoke louder than any words. In those days, judo was considerably more brutal than its present form. Kano added many subtle strikes into his techniques. The intensity of their performance was incredible and relentless, and the hall watched spellbound. “Ha, yes!” I heard Miyagi exclaim several times, clapping his hands in delight and whispering animatedly to the mayor. He clearly held Dr. Kano to be a martial artist of the highest order. When Kano had finished his own demonstration, he announced that the members of the local judo club would now demonstrate free sparring, and I noticed he wasn’t in the least out of breath. The young students engaged in a series of exciting throwing and grappling matches, and the level of their physical conditioning was obvious. When their matches had finished, another hour had passed in the blink of an eye. Kano left to wash and change into a fresh judo gi before returning to mingle with the crowd. He was quickly introduced to the mayor, who in turn introduced him to Miyagi. I squeezed through the throng, determined to be at my teacher’s side when he met the great man and hear what they had to say to one another, but when I got there, the mayor was doing most of the talking. “There are many fine masters on Okinawa,” Miyagi said quickly, then complimented Kano on the quality of his demonstration. “Martial arts is very good for the health and spirit of young people,” Miyagi said, then turned with a smile. “These are some of my own students,” he said, ushering us forward. “Splendid!” the mayor said, overjoyed that a man such as Kano should express such sentiment, “Perhaps we can persuade Miyagi and his students to give a small demonstration of their karate?” he said mischievously. “There’s no need,” Miyagi protested, but the mayor persisted. “Dr. Kano has seen our art before, demonstrated by two fine masters,” Miyagi said evasively. “Ah, but he has not seem the Naha style of karate, and tonight we are in Naha,” the mayor said triumphantly. “Our school is called Goju Ryu,” Miyagi answered. It was interesting, since judo contained the same character of Ju meaning soft or, more exactly, compliant or yielding. “Which elements are those?” Kano probed. Miyagi smiled. “We Okinawans are a simple people, Dr. Kano. We like to rely on simple methods in our fighting.” He raised his hand and clenched it slowly into a fist. Kano put his head to one side, still awaiting an answer. “Quite an achievement,” Kano said quietly. “An impossible dream,” Miyagi said quietly, a trace of bitterness in his voice. Kano nodded. It seemed he had chased the same dream himself. “You are familiar with Yoga, Mr. Miyagi?” he asked suddenly. Miyagi answered that he was. “A shared ambition,” Miyagi said. “An impossible dream,” Kano beamed, and Miyagi chuckled at having his own words quoted back to him. Kano’s smile remained, but his eyes were more serious. “I would be fascinated to see a demonstration of your art, Master Miyagi,” he said, and it was clear the request was far more than a simple attempt at politeness. Miyagi’s eyes returned to Kano’s, which hadn’t left his since Kano had made his request. He threw up his hands in defeat. He couldn’t refuse. Certainly a novel's imagined detailed scene although Kano shihan did go to Okinawa. And this is almost certainly Kano shihan, although it's not called out. Note the number of the audience in hakama versus keikogi. May have included non-instructional staff, and visitors, too.